Civil and Environmental Engineering PhD candidate Elaine Croft McKenzie was selected to present a poster, "A Strategic Optimization Framework for the Bus Fleeting Problem: Examining the Advantages and Tradeoffs of Alternative Fuel Buses," at the UTC Spotlight Conference on Transportation for Livable Communities. 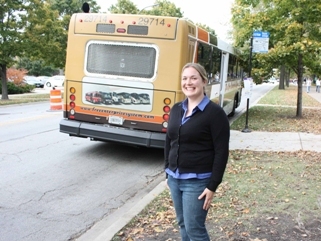 Elaine Croft McKenzie is a student in the Northwestern University Transportation Center and the Civil and Environmental Engineering department. CCITT is sponsoring her trip to Washington, DC, for the conference in October 2010. Croft McKenzie's research interests include environmental life-cycle assessment, transit infrastructure, decision-making models, supply chain logistics, and sustainability in aviation. She has a BA in Psychology from the University of Chicago and an MS in Civil and Environmental Engineering from Northwestern University. She also holds an FAA Private Pilot Certificate with an Instrument Rating and is active in the Chicagoland aviation community. Her advisor is Professor Pablo Durango-Cohen. CCITT sat down with Croft McKenzie to learn more about her career path and her poster for the Spotlight Conference. CCITT: You have a BA in psychology. How did this background lead to your pursuit of graduate education in civil and environmental engineering? Croft McKenzie: My undergraduate degree is in social psychology, specifically how people act and interact in groups. After graduation, I was a researcher at University of Chicago's Psychology department. I wanted to expand my research into looking at how people live and move in urban spaces, specifically in Chicago, which led me to look at programs in urban studies and civil engineering. I realized that although I enjoyed my job, I was not in a place to propose and focus on the questions that I was interested in, nor did I have the necessary skills to develop these questions into research that would have societal benefits. I also wanted to pursue the idea of understanding people and urban areas from a different angle. In psychology, my focus was on understanding the world through individuals and small groups. In engineering, the focus is on understanding larger structures, both physical and non-physical. Graduate school gave me the opportunity to explore this new perspective. CCITT: Describe your poster presentation for the UTC Spotlight conference on Transportation for Livable Communities. Croft McKenzie: In this presentation I show the monetary costs and greenhouse gas emissions associated with four transit bus technologies – Diesel, Hybrid-Electric Diesel, Compressed Natural Gas (CNG) and Hydrogen Fuel-Cell. We use the life-cycle assessment approach and try to capture the costs and emissions associated with the manufacture and operation of the bus, in addition to the indirect costs and emissions that come from the supply chain. One reason the life-cycle assessment approach is important is because people sometimes get caught up in a certain aspect of a new technology. For example, the Hydrogen Fuel-Cell bus is exciting because it has no tailpipe emissions. This is really great if you live next to the bus route, and using these buses can help cities reach their pollution reduction goals. However, when you include the costs and greenhouse gas emissions that come from the production of hydrogen, the transport of the fuel to the depot, the manufacture of the fuel cells, and the electricity needed to charge the bus's batteries, the emissions and pollution savings are not as great, and there may not be any savings at all. It is important for transit operators and policy makers to understand that there are a wide range of costs and tradeoffs that come with alternative fuel technology and to know which technology is best for their specific situation. CCITT: How does the bus fleeting research project fit into your overall research agenda at Northwestern? Croft McKenzie: My dissertation research is in developing and improving methods to conduct life-cycle assessment, specifically focusing on greenhouse gases from transportation vehicles and infrastructure. The bus case study is great because it is both methodologically interesting and very relevant to present day concerns about pollution and greenhouse gases. I believe that buses and other transit vehicles are important to the sustainability of our cities, but there are not many specifics available to help transit operators decide which technology is right for them. I am hoping that my research will make it easier for transit operators and policy makers to understand the implications of their decisions of whether to use or not use alternative fueled vehicles. CCITT: When do you expect to finish your dissertation and what are your goals upon graduation? Croft McKenzie: I expect to complete my dissertation in May of 2011. I'm currently on the academic and research job market for next fall, and I'm hoping to join a program that focuses on both research and implementation of sustainable technology and policy in the transportation sector. CCITT: And last but not least, you have your Private Pilot Certificate. What has been your most exciting experience as a pilot? How does your experience as a pilot impact your research? Croft McKenzie: Flying around Chicago is by far the best way to see the city. I've flown out of Midway and O'Hare, as well as most of the smaller fields. It's a pretty exciting view to be flying into Midway and look out to your right and see a Southwest Airlines Jet flying a parallel approach with you. By far one of the coolest things that I have seen flying in Chicago is the top of the Hancock building and the Sears tower sticking out of an otherwise unbroken layer of clouds over the city. I think it's pretty cool to stand on the ground and see the buildings disappear into the sky, but it's even more amazing to see the reverse – buildings sticking out of a cloud – from the air. Being a pilot keeps me in touch with the general aviation (GA) community, which is an interesting and vibrant part of the larger transportation community. Researchers and policy makers tend to focus only on the airlines, and so I believe that one of my roles is to remind people of the size and importance of the GA community. Most people tend to think of transportation in terms of cars and airlines, but GA, like public transit, serves a key function in our society. Besides, flying in a small airplane is perhaps the only mode of travel where the value of time is positive â€“ that is, you would be willing to pay to make the trip longer. In other words, it's a lot of fun. Using funding from CCITT, Professors Sridhar Krishnaswamy and Oluwaseyi Balogun led their research team to develop a compact and adaptive interferometric wavelength demodulator for fiber Bragg grating (FBG) sensors by using two-wave mixing technology. 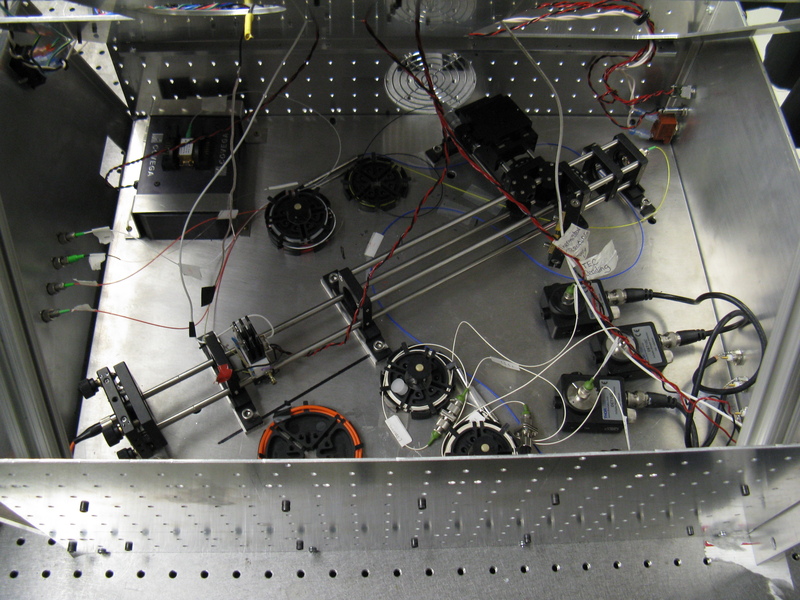 In the summer of 2010, Krishnaswamy traveled to Hong Kong with post-doctoral research associate Yinian Zhu and two Northwestern undergraduate students, Scott Bellis and Morgan McHugh, to test the device. The device was tested on a three-story model building on a "shaker" table at the Research Center for Urban Hazards Mitigation at The Hong Kong Polytechnic University. The team monitored the response of the model building subjected to free vibration, shaking ground motion, hammer impact loading, and the sudden loss of stiffness (one column broken). During the testing, the demodulator successfully detected vibration energy waves generated by fractures that occurred under loading. The experimental study demonstrated the potential application of the demodulator device in structural and civil engineering applications, particularly in the scenario of sudden change of infrastructure stiffness during earthquakes. Additional research funding was provided by the NSF-Partnerships for International Research and Education (PIRE) and PIRE- Intelligent Structural Health Management (ISHM) Undergraduate Research-Abroad Fellowship program led by Northwestern. Pictured are You-Lin Xu, Chair Professor and Department Head of Civil and Structural Engineering, Director of Research Center for Urban Hazards Mitigation, Hong Kong Polytechnic University (front row, second from left); Sridhar Krishnaswamy, Professor of Mechanical Engineering, Director of Center for Quality Engineering and Failure Prevention, Northwestern University (front row, third from left); Scott Bellis, undergraduate student, Northwestern University (front row, fourth from left); Morgan McHugh undergraduate student, Northwestern University (front row, fifth from right); Yinian Zhu, Research Associate in Krishnaswamy's group (front row, fourth from right); and Songye Zhu, Assistant Professor of Civil and Structural Engineering, Hong Kong Polytechnic University (front row, third from right). Two emerging research areas at the Northwestern University Transportation Center – Humanitarian Logistics and Disaster Relief and Transportation Energy and Sustainability – are supported through recent CCITT "innovation gap" awards. Industrial Engineering and Management Science (IEMS) Professors Karen Smilowitz, the Junior Patterson Chair of Transportation, and Irina Dolinskaya received CCITT funding for the development of decision-making tools for supply distribution in disaster relief environments. Diego Klabjan, also an IEMS faculty member and an expert in business intelligence techniques, secured an award to investigate and create a prototype software based decision support tool for the optimal deployment of alternative fueling stations for next-generation vehicles. This is Klabjan's second CCITT research project. The devastation caused by the 2010 earthquake in Haiti was compounded by the significant logistical challenges of distributing relief to those in need. Unfortunately this is the case with many disasters. Rapid and efficient distribution of water, food, medication, and other essential supplies is crucial to saving lives and rebuilding the region. Smilowitz's and Dolinskaya's research team will leverage its expertise in supply chain management and vehicle navigation under uncertainty to study design and operational improvements for humanitarian relief chains. They propose to research and develop decision-making tools for supply distribution for the relief community during disaster situations. 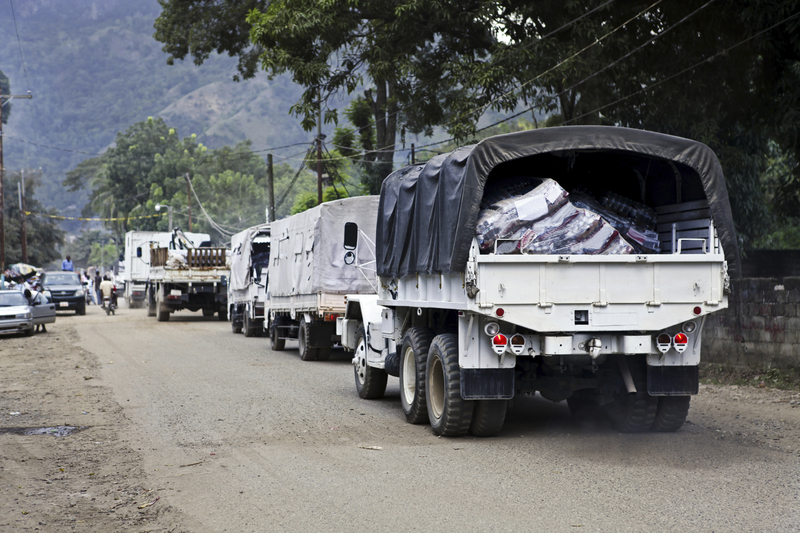 Distribution in commercial delivery services share some features with disaster relief. However, several critical attributes are not present. First, models and solutions must be accessible and easy to implement by relief workers operating in extreme conditions. End-users often lack the technical background and support during their operations, and they cannot implement complex optimization software used in industry under normal conditions. Second, situational awareness information of the logistics environment is generally quite limited following a disaster, to a degree not often encountered in commercial settings. Third, the objectives in disaster relief have not been extensively studied in other sectors. To address these issues, the research team will engage in three primary activities: learning from agencies about their current relief operations; developing prototype logistics models to improve operations; and transitioning this research to Northwestern engineers, trained through this initiative. The mass production of electric vehicles (EVs) is on the horizon. Several models of EVs from GM, Nissan, Ford, Honda, and others will be coming on the market beginning this year and spanning the next few years. One barrier to the widespread consumer adoption of EVs, and other alternative fuel vehicles, is "range anxiety," or the fear that a car will run short on fuel before a viable fueling station is located. 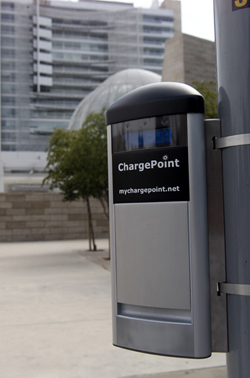 A few, forward-thinking cities have started deploying charging stations, and many others are in the planning stage. The EV infrastructure stakeholders – city governments, utilities, and private entities such as mall or parking operators – will benefit from information systems that enable the optimal deployment of refueling infrastructure. EV infrastructure-deployment considerations should include location-based consumer demand, charging cycle specifications impacting consumers, power grid implications, and station location decisions. The aim of Klabjan's project is to apply his research team's innovative analytical methodologies, including discrete choice modeling for demand measurement, optimization techniques for location recommendations, and simulations to assess system performance of the infrastructure deployment challenge. These techniques will be refined, tested, and deployed through a web-based decision support software application. The end-users of the software tool will benefit from the ability to conduct trade-off and what-if studies on investment budget, electrical power-grid, geographic, and infrastructure constraints, among others. Although this research project will primarily focus on the EV charging network, the underlying concepts and methodologies are also applicable to other alternative fueling technologies such as compressed natural gas, hydrogen, or biofuels. Public and private research collaborators on this project include Carbon Day Automotive, the Chicago Area Clean Cities Coalition (CACC), and LogicBox. Carbon Day and CACC will give feeback on the business and user experience and needs, whereas LogicBox will provide access to a software development platform, including user design expertise. Both Carbon Day and LogicBox are providing cost match support to this project. 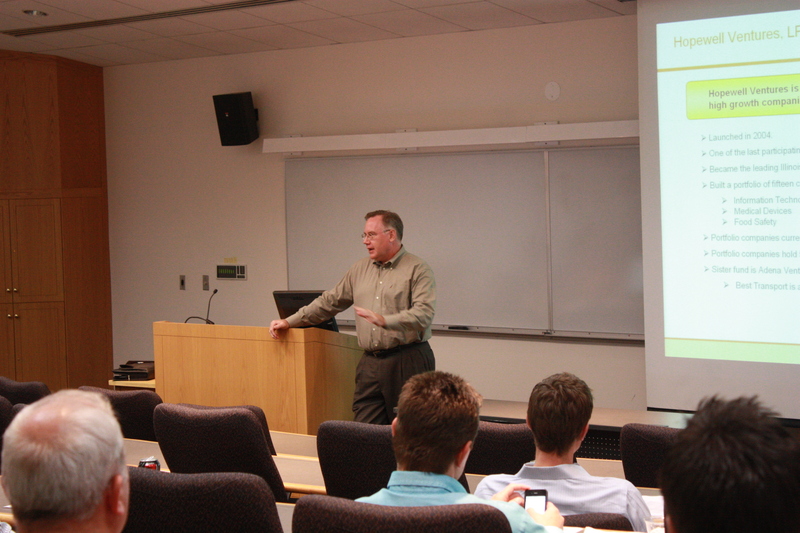 CCITT launched its 2010-11 Technology Commercialization Speaker Series in September with Thomas Parkinson of Hopewell Ventures. Hopewell Ventures, managed by Woodland Venture Management, is a venture capital firm focused on high-growth Midwest-based businesses. In August, Hopewell sold portfolio company SageQuest, Inc., a provider of GPS vehicle management solutions, to Fleetmatics, a provider of GPS fleet tracking services. During his talk, Parkinson described the journey of SageQuest's founders from idea conception to growth mode and investment to the eventual sale to Fleetmatics. Parkinson stated the bottom line--it was a tough path to revenue breakeven fraught with potholes, roadblocks and "forks in the road." Near the outset, the founders hired a serial entrepreneur as CEO who "knew the process of sales." So why did a venture capital firm make an investment in a transportation related business? Hopewell "liked" the potential of the transportation (freight or fleet) market: freight and congestion were increasing, logistics efficiencies were needed and developing, and the trajectory of fuel pricing was up. Hopewell initially passed on SageQuest but followed the company's progress. Eventually sales picked up, and Hopewell took notice. Parkinson identified several factors through due diligence and ultimate management oversight that propelled the company to positive results. SageQuest had an experienced management team that was willing to make course corrections and solve strategic business challenges. They provided a core product without "bells and whistles" that produced measurable return-on-investment for its customers, such as fuel savings and worker productivity. SageQuest also developed multiple revenue streams and integrated its product to widely used mobile workforce management tools. 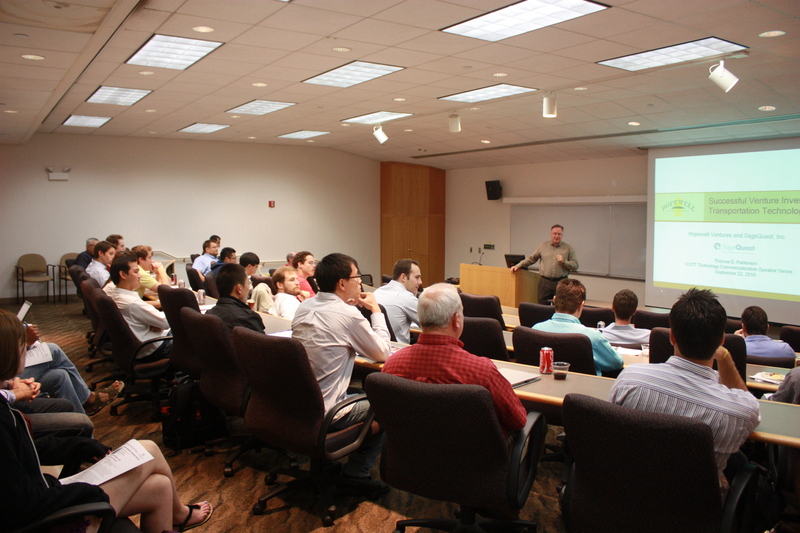 Parkinson provided attendees, including undergraduate and graduate engineering and business students, faculty, and industry, with further startup business growth insights: (1) build a quality product that delivers value to the customer, not necessarily the best, proprietary technology; (2) focus on the bottom line and minimize expenses especially in a tough economy; (3) develop multiple, recurring revenue streams; and (4) develop a company that is valued by many potential buyers. CCITT will host two Technology Commercialization Speaker Series events in October and November. John Hillman, Senior Associate at Teng & Associates, will speak on October 26th and Neal Campbell, CEO of TrafficCast, will speak on November 17th. For more information, visit ccitt.northwestern.edu.